The City of Deerfield Beach Parks and Recreation Department has released plans for the 3rd annual Ocean Brews & Blues Festival. The event will take place Saturday, May 18, 2019, from 4:00 PM to 8:00 PM in the Main Beach Parking Lot, located at 149 SE 21 Ave in Deerfield Beach. You can spend the day on the beach while enjoying the craft beer festival. The event includes unlimited samplings of an assortment of 125+ beers from some of the area’s and the nation’s best craft breweries! 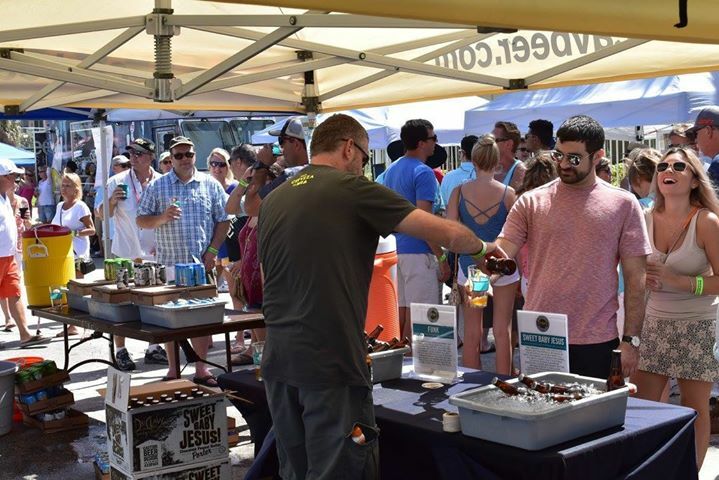 While you sample the beers, you will be able to enjoy the sound of blues music or maybe taste a smooth IPA is while checking out the wide assortment of arts and crafts vendors. The event is free and open to the public. However, you will need to purchase a ticket in order to sample the craft beers. General admission tickets that are purchased prior to the event cost $40/person and include four hours of unlimited sampling plus a souvenir glass. Tickets purchased at the event on the day of the event will be $45/person. VIP tickets are available ($60/person) and will include a one-hour early access that starts at 3:00 PM, VIP swag, sampling of specialty VIP brews and special food samples in addition to the general admission ticket. You can purchase festival tickets online at www.dfb.city/oceanbrew. If you enter the promo code “oceanbrews”, you will receive $5 off your purchase through April 12th. Parking on the barrier island will be limited during the course of the event. Attendees can take a short walk over the bridge to the event or you can hop on the complimentary shuttle service. Free parking will be available at the Cove Shopping Center, 1500 E. Hillsboro Blvd. The shuttle service from the Cove will be running continuously starting at 2:30 PM until 8:30 PM. Participating Breweries include: Anchor Brewing Company (1896), Barrel of Monks, Biscayne Bay Brewing Company, Black Clover Brewing, Civil Society Brewing, Dangerous Minds, Descarga Brewing, Due South Brewing Co, Florida Hops LLC, Funky Buddha Brewing, Gulfstream Brewing, Holy Mackerel, LauderAle, Mathews Brewing Company, Misfits Brewing, Nightlife Brewing, Octave Brewing, Prosperity Brewers, Robot Brewing, Saltwater Brewery, Sapporo Black, Tarpon River, Taylormade Brewing Co., Unibroue, Weed Reaper Experiment, Wynwood Brewing and more to come! You can get additional information by calling Deerfield Beach Community Events and Outreach Division at 954-480-4429 or by visiting www.dfb.city/oceanbrew or the event website. This story was prepared by our Deerfield Beach news desk with additional information from various public sources and their websites. For more Deerfield Beach news and events information you can go to our website and read our publication, Deerfield Beach Magazine.